Local sisters Cherry and Kay (previously Lime Caffeteria) have again joined forces to open “Eat Streats” Atticus Finch. 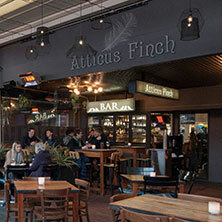 Atticus Finch was created with your enjoyment in mind! The Atticus Finch team will turn your dining experience into more than just a meal – a destination to linger over lively conversation, playful plates and thoughtful concoctions. The vibe of Atticus Finch is speakeasy meets metropolitan bistro. Our house was made for entertaining – situated in the middle of “Eat Streat”, taking advantage of the geothermal under floor heating of the concrete outside, retractable awning and covered walkway. Our dining menu is designed to share, a combination of carefully selected ingredients that allow a series of tastes to be passed around and enjoyed together. Our food is fresh, innovative, flavoursome and made from scratch. The beverage menu showcases inspired selections of local craft beer, wine by the glass and seasonally crafted cocktails made with our own syrups, fresh fruit and herbs. 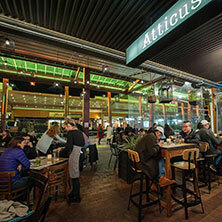 Simply put, Atticus Finch is a great place to gather with friends and enjoy the best pours and plates in town. Drink with us, Dine with us, Share with us.